Today, Edinburgh Art Festival announces the first details of the 2019 programme. Running from 25 July – 25 August, and presenting its 16th edition, Edinburgh Art Festival is the major platform for the visual arts as part of Edinburgh’s world-famous August festival season. Bringing together leading names alongside the best new talent from Scotland, the UK and beyond, the citywide festival has its origins in Edinburgh’s dynamic and ambitious year-round visual arts scene. The 2019 Festival programme is testament to the continued vitality of the sector, with two major new spaces presenting their first Festival shows, a host of new work by international and Scottish artists, as well as major retrospectives and the opportunity to discover the best new talent. The 2019 programme will feature an impressive range of new work commissioned by our partners for the Festival. Real Music presented by the University of Edinburgh’s Talbot Rice Gallery is Hong Kong artist and composer, Samson Young’s first exhibition in Scotland and his first major solo show in the UK. Using sound, image and objects, Young creates innovative multi-media installations that confront cultural, political and aesthetic boundaries. All the works shown in Real Music are underpinned by a rigorous research process that explore a myriad of topics – including orchestral performance, cultural appropriation, social and musical histories. A major new commission created through Samson Young’s collaboration with the Next Generation Sound Synthesis (NESS) research group within Edinburgh University’s Reid School of Music will be presented alongside existing work, and items from the University’s collections. Gateway by Portuguese sculptor Joana Vasconcelos is a major new addition to Jupiter Artland’s landscape and follows on from their 2018 gallery exhibition, presenting an intricately designed pool set within a landscaped formal garden and accompanied by a delicate glass dome space. Shaped from over 11,500 hand-painted and glazed tiles traditionally manufactured in Vasconcelos’ native Portugal, the swathes of brightly coloured motifs span social histories and collective narratives, journeying through sacred geometries to the zodiac and beyond. Edinburgh Sculpture Workshop invites French artist Caroline Achaintre to make new work for its large outdoor courtyard. Achaintre is known for her sculptures in ceramic and metal as well as her drawings, prints, watercolours and fabric pieces in the form of tufted rugs. Her work brings together abstraction, figuration, humour and materiality, the individual sculptures often becoming ‘characters’ which evoke their own narrative connections. Two of Edinburgh’s most exciting new spaces, Collective and Edinburgh Printmakers, will host their first Festival exhibitions in their new homes having transformed historic spaces in the city into major year-round contemporary art centres. Deer Dancer is an ambitious cross-artform project by Finnish-English artist, vocalist and musician Hanna Tuulikki presented by Edinburgh Printmakers from their vibrant new creative hubhoused in the former North British Rubber Company building in Fountainbridge. The project, which investigates deer mimesis within traditional dance, will be realised as an audio-visual installation, incorporating innovative music, costumed choreography on film, and visual scores, presented alongside a new series of prints commissioned as part of a printmaking residency at Edinburgh Printmakers. In their first Festival showing in their new space, Collective presents Migratory Motor Complex by 2014 Turner Prize nominee James Richards in one of Edinburgh’s newest contemporary art galleries sitting atop Calton Hill and breathing new life into Edinburgh’s City Observatory, previously closed to the public for over 100 years and which reopened in late 2018. Richards’ exhibition features Migratory Motor Complex (2017), a six-channel electro-acoustic installation that explores the capacity of sound to render artificial spaces and locate sonic and melodic events within them. The work is tuned in situ, with Richards reacting to the acoustic contingencies of the City Dome to create a cinematic and multi-sensory experience. NOW, the Scottish National Gallery of Modern Art’s dynamic three-year series of contemporary art exhibitions, presents the fifth instalment in the series with a major survey of work by Anya Gallaccio. The Paisley-born artist, who was nominated for the Turner Prize in 2003 and was a prominent figure in the Young British Artists generation, is renowned for her spectacular installations and sculptures. Exploring themes of change, growth and decay, other artists appearing in NOW are French artist Aurélien Froment, sculptor and installation artist Roger Hiorns, Scottish artist Charles Avery, Peles Empire a collaborative artistic project consisting of two German artists, Katharina Stöver and Barbara Wolf and French-born Algerian artist Zineb Sedira. 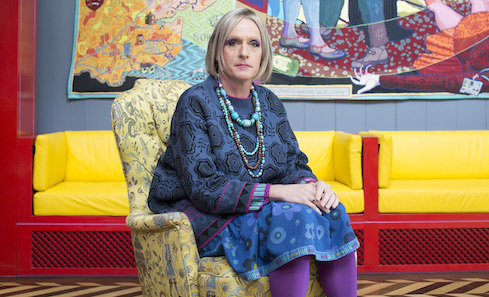 Dovecot Studios presents GRAYSON PERRY:Julie Cope’s Grand Tour by the 2003 Turner Prize winner and self-styled “unapologetic fetishist” Grayson Perry, marking Perry’s first exhibition in Scotland. Perry has brought tapestry right to the centre of the contemporary art world and pop culture. Offering the final chance to see Julie Cope’s Grand Tour, the exhibition has been expanded to include the complete series of incredible tapestries as well as tapestries created by Dovecot weavers to explore the artistry, skill and techniques used to create these extraordinary objects. Marking the 100th anniversary of the founding of the Bauhaus by Walter Gropius in 1919, My Own Private Bauhaus by artist David Batchelor pays tribute through a personal appreciation of the triangle, circle and square signifying the simplicity of the Bauhaus movement as presented at Ingleby. The title of Stephen Bird’s Kiln Gods at The Scottish Gallery refers to the small sculptures made by potters to act as talismans of good luck during the firing process. Bird’s work picks up on the traditional in this way – referencing the heroes of ceramic sculpture – but with a subject matter that is uniquely his own. This exhibition will consist of some of these subversive sculptural works as well as plates – the themes of which are both dark and wry, comic and tragic; full of personal and historical reference, narrative and myth. The 2019 Festival programme includes work by some of the most influential and revolutionary photographers working in the 20th century including: Stills: Centre for Photography who will presentCindy Sherman: Early Works, 1975-80, showcasing seminal early works by Sherman, one of the most influential artists of the last 40 years, including the series Untitled (Murder Mystery People), some of Sherman’s earliest self-portrait photographs made in 1976, the 16mm film, Doll Clothes (1975), and a selection of works from Untitled Film Stills (1977-80), the series for which Sherman first gained international recognition. The Scottish National Portrait Gallery celebrates the work of three of the twentieth century’s most influential photographers; Francesca Woodman, Diane Arbus and Robert Mapplethorpe inARTIST ROOMS: Self Evidence – Photographs by Woodman, Arbus and Mapplethorpe. While The Long Look, a collaboration between the painter Audrey Grant and the photographer and printmaker Norman McBeath, explores the art of portraiture beyond the conventional artist and sitter relationship, revealing what became a unique creative exchange between the two artists. Edinburgh College of Art’s Tent Gallery as part of the University of Edinburgh presents Grey to Blue the work of Siberian-born, Scotland-based artist and filmmaker Yulia Kovanova. The piece reconsiders spatial and perceptual boundaries, focusing on the exploration of colour and movement, and explores the crossovers between people, society, and the environment. Kovanova often takes a transdisciplinary approach, across a range of media from moving image and sculptural installations to collaborative performances. Collective will showcase work from Scottish artist Helen McCrorie featuring a new film centred on a child-led outdoor playgroup that meets in the grounds of a former military camp in Scotland. This site, adopted by families for imaginative play and experiential learning, also houses a bunker transformed into a data storage unit. Part of Collective’s Satellites Programme, the film celebrates innate creativity and explores our understanding of data gathering and learning as interconnected yet diverging processes. Edinburgh Art Festival offers the chance to encounter and discover a hugely diverse range of work from the most acclaimed established artists but also proudly provides a vital platform to showcase and support new artistic talent. Lucy Wayman has been commissioned to create a new public sculpture for the cycle path close to Edinburgh Sculpture Workshop, connecting Newhaven to Edinburgh City Centre. Wayman’s practice makes use of craft techniques, such as weaving, knotting and macramé, but at scale and with a dynamism that surprises. This is her first major outdoor commission and is supported by Edinburgh Sculpture Workshop’s partner Sustrans, through their ArtRoots programme. Artist Adam Benmakhlouf has also been commissioned to make a sound work for Edinburgh Sculpture Workshop’s Beacon Tower. This new work will draw on Benmakhlouf’s knowledge and experience of Edinburgh Sculpture Workshop’s building and surrounding environment as well as the principles of its experimental Schools Programme on which he’s been an assistant for two-years. Jupiter Artland has commissioned South African artist Mary Hurrell to create a new performance which will unfold in two parts – on the opening weekend of the Edinburgh Art Festival, followed by a second performance on the closing weekend which also forms part of Jupiter Rising, Jupiter Artland’s annual festival of art, music and performance. Hurrell will produce a new site-specific work for the bodies of water at Jupiter Artland. Continuing her interest in relationships between water, emotional physical states and the feminine, the twin works will explore ideas around membranes or thresholds, a space of connectivity between what is visible and invisible, still and fluid, intimate and protected. Double Disaster (Closing Down) sees artist duo Yokollection (Alexa Hare and Francesco Nobilucci) present a video pilgrimage to the site of John Lennon and Yoko Ono’s 1969 car crash in Durness, alongside key works at Edinburgh College of Art as part of the University of Edinburgh. Exploring themes of death, sexuality, fetishism and fandom, Yokollection transport the viewer from Inverness in the Highlands to the far North West of Scotland as they learn to drive with the aid of a local instructor, Craig. Arusha Gallery presents All That the Rain Promises and More... a group show by guest curator Aimee Parrott, bringing together 17 cross generational artists including emerging artists Sean Steadman and Paloma Proudfoot (who was previously supported through the Festival’s Platform programme for early career artists) alongside established artists such as Helen Chadwick andIthell Colquhoun. Looking to the fruiting body of the fungus, the mushroom, as a starting point and exploring ancient myths and folkloric legends to recent scientific discoveries, fungi have been heralded as a powerful symbol of hope, ecological connectivity and the promise of renewal, reproduction and fertility. Edinburgh College of Art as part of the University of Edinburgh will also once again welcome visitors to their Masters Degree Show. A postgraduate showcase, including new work from postgraduates in a range of disciplines from Contemporary Art, Illustration, Interdisciplinary Creative Practices, Materials Practice and Art, Space & Nature and glass. The City Art Centre presents the first major survey devoted to the work of one of Scotland’s most celebrated artists, Victoria Crowe. Embracing every aspect of her practice, Victoria Crowe: 50 Years of Painting will feature over 150 paintings, stemming from youthful student works to the assured, timeless landscapes and portraits of recent years. Intimate at The Fine Art Society mounts a group exhibition of portraiture, depicting sitters with whom the artist is close. Comprising works from the early 20th century through to pieces by contemporary artists including John Byrne, Jennifer McRae, Norman McBeath, Niall McDiarmid, Ishbel Myerscough, Eduardo Paolozzi. Alongside sculptor Nicole Farhi presenting Writing Heads, a sculpted and painted a series of 25 busts of 20th century novelists and playwrights, from Françoise Sagan to Muriel Spark and Samuel Beckett. Farhi models her figures as a response to their identity and work, sculpting her feelings towards the figure as much as their recognisable qualities. The Scottish Gallery presents Ever After which reflects the ongoing dialogue in Derrick Guild’s work with art history. The title is taken from an artwork consisting of forty individual miniature works which relate to portraits by Sir Peter Lely, Sir Anthony van Dyck, Sir Henry Raeburn and Pompeo Batoni. Details and fragments which include eyes, mouth, ears, jewellery and clothing are presented within small oval frames connected by fine gold chain. At the Royal Scottish Academy, the National Galleries of Scotland present a major retrospective from one of the most distinguished and world-renowned artists working today Bridget Riley. This marks the first museum survey of Riley’s to be held in the UK for 16 years, the first of its kind in Scotland and will span over 70 years of work, placing particular emphasis on the origins of Riley’s practice and tracing pivotal moments across her acclaimed career. Russia: Royalty & the Romanovs at The Queen’s Gallery, Palace of Holyroodhouse will explore the 300-year relationship between Britain and Russia and their royal families through decorative arts, paintings, jewellery, costume, books, letters and photographs from the Royal Collection, many of which are on public display in Scotland for the first time. The exhibition showcases a huge range of works from artists such as Laurits Regner Tuxen, Carl Fabergé, Franz Xaver Winterhalter, Sir Thomas Lawrence and Sir Godfrey Kneller. Wild and Majestic: Romantic Visions of Scotland at the National Museum of Scotland will feature rich displays and iconic objects as the landmark exhibition uncovers how Romantic interpretations of the cultural traditions of the Scottish Highlands and islands became enduring symbols of wider Scottish identity. It will include the work of artists such as Sir Henry Raeburn, William Turner and Sir Edwin Landseer. The National Galleries of Scotland presentCut and Paste: 400 Years of Collage the first survey exhibition of collage ever to take place anywhere in the world. Highlights include a three-metre-long folding collage screen, purportedly made in part by Charles Dickens; a major group of Dada and Surrealist collages, by artists such as Kurt Schwitters, Joan Miró, Hannah Höch and Max Ernst; and major post-war works by Henri Matisse, Robert Rauschenberg, and Peter Blake, including the only surviving original source photographs for Blake’s and Jann Haworth's iconic, collaged cover for the Beatles’ album Sergeant Pepper’s Lonely Hearts Club Band. John Busby: Silent Landscape a large-scale exhibition presented by The Open Eye Gallery centring on the distinctive landscape paintings by celebrated artist John Busby with an extensive collection of Busby’s lesser known landscape paintings. The exhibition will explore the relationship between form and content; the shape, colour and compositional energy of these works expressing a much deeper level of contemplation. To coincide with Silent Landscape, John Busby Remembered sees an exhibition of invited artists who worked alongside, and who were acquainted with, Busby during his prolific career. Featuring large-scale works by artists such as Barbara Rae and John Bellany this commemorative exhibition celebrates Busby through the eyes of his contemporaries. The full 2019 Edinburgh Art Festival programme will be unveiled in the coming months, including details of the Festival’s commissions programme and an extensive range of diverse and engaging events. Edinburgh Art Festival runs from 25 July – 25 August 2019. Kate Gray, Director, Collective said: 'This year will be Collective's first Edinburgh Art Festival in our new home on Calton Hill and we are delighted to be bringing the whole site to life through a mixture of installation and film work from artists James Richards and Helen McCrorie. We look forward to welcoming visitors from all across the globe to Edinburgh and contributing to this shared celebration of visual art in the city." Sir John Leighton, Director-General, National Galleries Scotland said: “The National Galleries of Scotland is proud to play a central role in Britain’s only major annual festival of the visual arts, contributing to the breadth and range of the programme which characterises the Festival as a whole, with major survey shows, and leading international names appearing alongside emerging artists. Our Edinburgh Art Festival exhibitions this summer encourage us all to think more deeply about the world around us. Councillor Donald Wilson, Culture and Communities Convener for the City of Edinburgh Council, said: “We are proud to be home to one of the biggest celebrations of visual arts in the UK and once again the Festival looks set to deliver an exciting and diverse programme this year. Artists from all over Scotland and the world are invited to showcase their work in Edinburgh’s art galleries and unusual exhibition spaces. Founded in 2004 and now in its 16th edition, Edinburgh Art Festival is the platform for the visual arts at the heart of Edinburgh’s August festivals, bringing together the capital’s leading galleries, museums and artist-run spaces in a city-wide celebration of the very best in visual art. Each year, the Festival features leading international and UK artists alongside the best emerging talent, major survey exhibitions of historic figures, and a special programme of newly commissioned artworks that respond to public and historic sites in the city. Edinburgh Art Festival is a registered charity supported by Creative Scotland and the City of Edinburgh Council. For more information, please visit www.edinburghartfestival.com or follow the Festival on Facebook, Twitter and Instagram @EdArtFest #EdArtFest. The City of Edinburgh Council is a funding partner for Edinburgh Art Festival. The Council accommodates the organisation at City Art Centre and provides regular use of Trinity Apse and other Council-owned property for festival activities. The Council aims to maintain and build on Edinburgh's reputation as the ideal location for major events and festivals. Working with the city’s cultural sector, the Council’s arts development team ensures that arts play a vital and lasting role in Edinburgh by developing strategic policy, offering advice on cultural projects and awarding cultural grants.